Perhaps your organization already considers its associates leaders. Are they also artists? Is it possible to demonstrate artistry in every role? Author Erik Wahl believes it is. “The truth is that regardless of your age or perceived artistic skills, you can be an artist with a unique ability to create meaningful, breakthrough art on a regular basis, no matter where you work and no matter what your job title happens to be,” according to Wahl. Wahl’s book Unthink: Rediscover Your Creative Genius (2013, Crown Business) describes his journey from a traditional business career to becoming a graffiti artist, author, speaker, and entrepreneur. The book is reflective, but with a strong action orientation. It’s designed for leaders, teams, and organizations seeking new ways to infuse creativity, empowerment, and innovation in the workplace. Wahl’s career path gives him a unique perspective. After doing well in school and becoming a self-described “operationally efficient” rule follower, he landed a corporate job, which he lost when the dot-com bubble burst. This unexpected transition created an opportunity for Wahl to explore new possibilities and his interest in art. The first two sections of Unthink, THEN (who you were) and NOW (who you are) describe how to rediscover the fearless creativity of childhood. According to Wahl, “The greatest resource we have is not external. It’s creativity. It’s our internal resourcefulness – our ability to differentiate, reformulate, and adapt to our ever-changing circumstances.” Two specific ways that organizations can spark more creativity are through the physical environment, and by allowing people time to explore spontaneous possibilities. Companies like Google have created offices “…hoping to spark that same rich, vibrant environment of childhood,” and regularly give people time to follow their natural curiosity. According to Wahl, “play is the supreme catalyst.” As you think about your team’s workspace, is it encouraging people to explore new possibilities? Is it possible to give people some time to follow their natural curiosity? The third section of the book, and longest in terms of page count, is the forward-looking HOW (who you can still be). HOW is structured with an artist’s flair (see the book’s table of contents for more on this) and describes seven specific behaviors to cultivate creativity. Three behaviors that are particularly helpful from a leadership perspective are be intuitive, be accelerated, and be provocative. While much has been written about intuition, Wahl’s approach is to examine it in a business context. Wahl describes how, “Intuition and intellect are not in opposition to each other. In fact they must work together if you are to reach your creative potential.” He cites modern and classic examples where intuition has led to new innovations and breakthroughs, from Steve Jobs following his intuition to provide early backing for now-famous Pixar to Jonas Salk, inventor of the polio vaccine, who said, “Intuition will tell the thinking mind where to look next.” Wahl reminds us that interactions with others also frequently lead to new solutions, so making time for, and paying attention to, these interactions are important ways to be intuitive. In what ways are you using intuition in your work now? How might you further leverage your intuition to create new opportunities? Be accelerated is all about having a bigger impact. Wahl’s approach to his own work is to accelerate his output, have a simple message, and make an immediate impact. “It’s the path you should take too if you want to reach a new level of creative effectiveness on the job,” according to Wahl. One way to keep things moving and prevent analysis paralysis is to remember that, “progress does not require perfection”; being nimble is what’s important. To accelerate your own impact, Wahl offers tried and true tips: work smarter, focus on what you can control, and be okay with failure. If fear of failure is a challenge for you or your team, what one small step could you take to remove some of the fear? For example, could you reframe a new initiative as a pilot, experiment, or a learning opportunity? In Be provocative Wahl discusses the importance of looking ahead and demonstrating courage. “By becoming provocative – by constantly looking for obstacles to growth and opportunities for progress regardless of your daily duties – you can provide your company with a measure of critical preparation it doesn’t currently have,” according to Wahl. Be provocative by stepping outside of your comfort zone and taking ownership. “Don’t shy away. Don’t hold back. Provoking the status quo is the only way anything gets better,” according to Wahl. What obstacles and opportunities are you seeing in your organization? If you challenged the status quo, what positive change might you create? While the book is very visual in terms of themes, it doesn’t include any images of Wahl’s art. For that, you’ll want to visit his website. 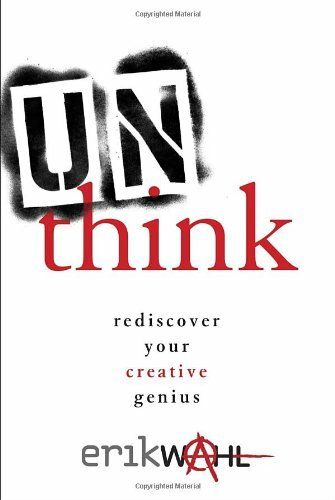 Unthink is a helpful resource for leaders, teams, and organizations wanting to rediscover and leverage their creativity.